Takaoka Lacqueware（高岡漆器） was first made in 1609 when Toshinaga Maeda, the second load of the Kaga Domain, built Takaoka Castle in Takaoka city. He ordered to make arms and armor, drawers, and low dining tables. After that new techniques such as tsuishu (堆朱) and tsuikoku (堆黒) were introduced by China. Also various techniques such as chokoku-nuri (彫刻塗), sabie (錆絵), raden (螺鈿), and zonsei (存星) which look solid using a variety of lacquer colors were produced, and those techniques developed Takaoka Lacquerware and made it famous. These techniques took root as townspeople culture and had a progressive development due to the traditional festival in Takaoka where gorgeous festival cars called mikurumayama (御車山) have used and decorated with them. 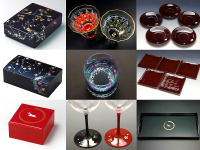 In 1975, Takaoka Lacquerware has been nominated as traditional crafts of Japan.